In the mean time, what have I been reading? I have many magazines all the time and have subscribed to a new one: Domino. This is my kind of fashion mag. It's focus is modern home and lifestyle, fun, hip, not too expensive home and lifestyle. Their latest issue was all about greening your home (Well, let's be serious and say who's latest issue isn't?) and there were plenty of great resources I've looked up and bookmarked for future reference. I still plow through the New Yorker and am halfway through the latest Oprah and Sunset Magazine. Sunset has a good veggie gardening article and their recipes are always worth a try. Budget Travel is really my favorite magazine at the moment as it is A) about travel and B) actually offers affordable suggestions. I was getting Travel + Leisure but am letting it go without renewal. I love to aspire to what they offer, but for the moment get frustrated by their "Rome Hotels on a Budget" articles where the hotel rooms are only $395 per night! Someday, I know I'll be able to afford that if I want to, but for now, um, not quite. I will be getting National Geographic Traveler in the not too distant future. (Thanks for that hot tip, Lisa!) These travel magazines are all part of my research into travel photography. Oh and I love to travel so that doesn't hurt too much either...Oh and as part of my new subscriber sign up, I got two free maps -- one of the world (which I already have a copy of on my wall from before -- thought it will be interesting to see what has changed.) and one of Italy. Perfect! Of course there are the weekly magazines, Time and Entertainment Weekly which get read pretty quickly as they come in. Entertainment Weekly has Stephen King as a monthly contributor and his columns I always love. Diablo Cody (she of oscar-winning fame for Juno) is also a monthly writer and at first I wasn't sure about her style, but I have warmed up to it and am inspired by her. Books you say? Oh books yes. I watched (via Netflix) The Jane Austin Book Club one cloudy Saturday and had to immediately reread Sense and Sensibility. So I did. Then I had to reread Pride and Prejudice, which I did. I'm a history nutjob and read these books for the time and place as much as the characters and story. I know these stories backward and forward and yet still surprise myself by having feelings of "what's going to happen??" It's the 11 year old reader, still in me, and I love that feeling. 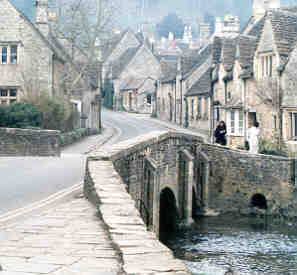 We also spent time in Rodmell, Bourton-on-the-Water and Corsham. At Corsham we toured the manor house attached to the village. The man himself, Lord Methuen still lived there and actually showed us a few rooms indoors and part of the garden. The curator, Mr. Peach (shouldn't that be a character in a Dickens book?) showed us the art and furniture and his wife, Mrs. Peach (!!!) also came to chat and be a bit catty about our B&B owner who had lost some recent election. All very local and gossipy, just what you want in an English country manor tour! Can't wait to book the Jane Austin village tour. Can't wait for the dollar to get stronger (ahem) and for us to hit the road.